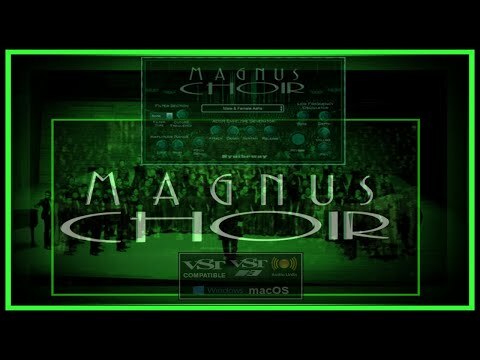 Magnus Choir is a virtual musical instrument VST plug-in software developed by Syntheway Virtual Musical Instruments and can be used to create natural and synthetic choirs, vocal textures and sustained vowels. It may work as a plugin within DAW (Digital Audio Workstation) software such as Image-Line FL Studio, Steinberg Cubase, Ableton Live or Cakewalk SONAR among others. This Virtual Musical Ensemble of Singers features male and female mixed choirs in the classic SATB -Soprano, Alto, Tenor, Bass- structure: women sing Soprano and Alto, while men sing Tenor and Bass. Sound is generated via a hybrid method that combines synthesis and sampling. It features 48 built-in presets sounds including a variety of choirs and additionally includes choral pads, vocal textures, effects and spatial voices. Features complete MIDI Continuous Controller to automate parameter changes from a sequencer, or to control the Magnus Choir software from an external MIDI control surface. - Windows Operating System : Windows XP, Windows Vista, Windows 7, Windows 8 / x86 (32 bit). - For Windows x64 (64 bit) test it first with VST Bridge, jBridge or BitBridge. 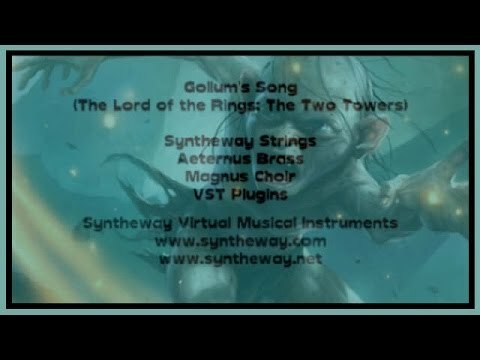 1.- Syntheway Strings VSTi: Is a sample based Ensemble Strings with Violin, Viola, Cello & Double Bass ensemble. 2.- Aeternus Brass VSTi: Is a Virtual Brass instrument, featuring solo Trumpet, Cornet, Trombone, Tuba, French Horn, Flugelhorn as well as Brass Sections and Orchestral Ensemble. 3.- Magnus Choir VSTi: Virtual instrument plug-in which can be used to create natural and synthetic choirs, using a combination of synthesis and sampling. 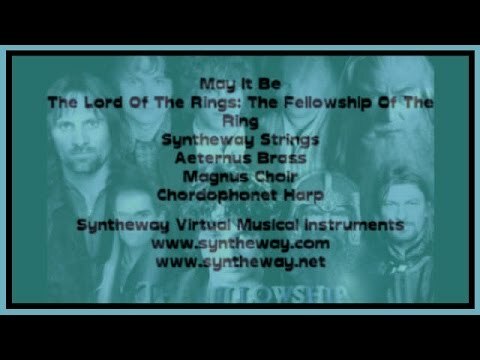 (*) "May It Be" is a song composed by Irish musician Enya and featured in Peter Jackson's 2001 film The Lord of the Rings, the Fellowship of the Ring. 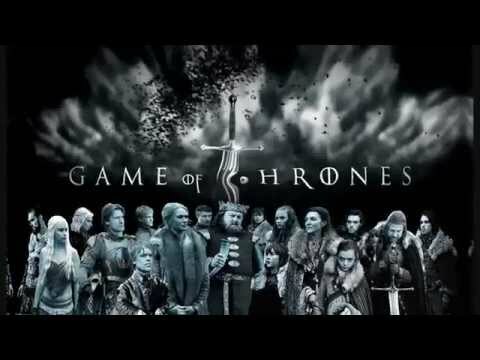 * The music for the fantasy TV series Game of Thrones by the U.S. cable channel HBO is composed by Ramin Djawadi and published by Varèse Sarabande. 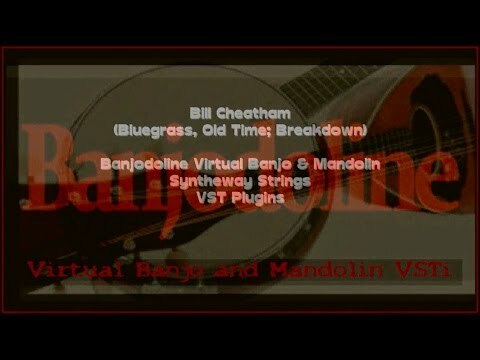 1.- Syntheway Strings VSTi: Is a rich-sounding sample based string VST instrument, featuring a multisampled Ensemble Strings with Violin, Viola, Cello & Double Bass. Syntheway Strings has the ability to produce beautiful and lyrical lines, as well as powerful and forceful articulations. 2.- Magnus Choir VSTi: is a virtual instrument plug-in which can be used to create natural and synthetic choirs, using a combination of synthesis and sampling. 3.- Aeternus Brass VSTi: Virtual Brass featuring solo Trumpet, Cornet, Trombone, Tuba, French Horn, Flugelhorn as well as Brass Sections and Orchestral Ensemble. 4.- Chordophonet Virtual Harp and Hammered Dulcimer is a Virtual Harp and Hammered Dulcimer sample based software instrument, featuring Celtic and Concert Harps, Pre-recorded Harp Glissando and Upward-Downward Harp Glissando, and Hammered Dulcimer modes. 1) Orchestral Percussion: Instruments distributed across 5 octaves keyboard. - Khol (Mrdanga, Mridong, Mridanga). Not to be confused with Mridangam. OS: Apple Mac OS X v10.6 "Snow Leopard", Mac OS X v10.7 "Lion", Mac OS X v10.8 "Mountain Lion", Mac OS X v10.9 "Mavericks", Mac OS X v10.10 "Yosemite". 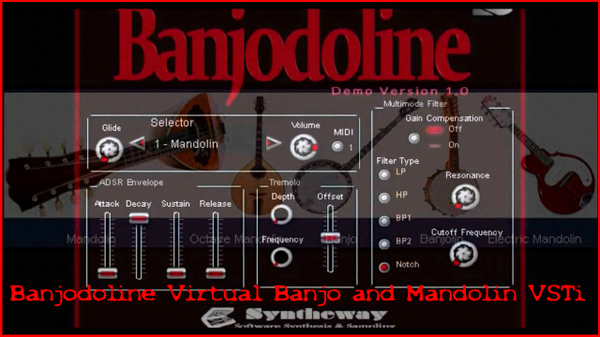 Banjodoline is a Virtual Banjo and Mandolin sample-based software, including a Banjolin, Octave Mandolin and Electric Mandolin fretted stringed instruments. - Multimode Filter. The use of values automatically computed by a multimode filter gives a wide range of interesting tones. Filter switch includes: LP (Low pass), HP (High pass), BP1 CSG (Band pass 1, constant skirt gain), BP2 C0PG (Band pass 2, constant 0db peak gain), Notch (Band-stop/Band-rejection) filters with adjustable Resonance and Cutoff Frequency range extends up to Nyquist. Gain Compensation option for LP, HP and BP1 filter types. - Tremolo Section: Contains a LFO (Low Frequency Oscillator) with modulation depth, frequency and offset. This creates a kind of a “trembling” sound. - Affordable price and user-friendly attitude are sure to attract many enthusiasts and musicians. Syntheway is proud to present "Chordophonet" a software to emulate the Celtic and Concert Harps, plus Hammered Dulcimer VST. It's a versatile virtual instrument designed for musicians, performers and producers of all types. Chordophonet is a Virtual Harp and Hammered Dulcimer sample based software instrument, featuring Celtic and Concert Harps, Pre-recorded Harp Glissando and Upward-Downward Harp Glissando, and Hammered Dulcimer modes. - Pre-recorded Harp glissando and upward-downward Harp glissando.